Jul 28, 2018; Englewood, CO, USA; Denver Broncos wide receiver River Cracraft (15) during the first day of training camp at Paul D. Bowlen Memorial Broncos Centre. Case Keenum, the Broncos' No. 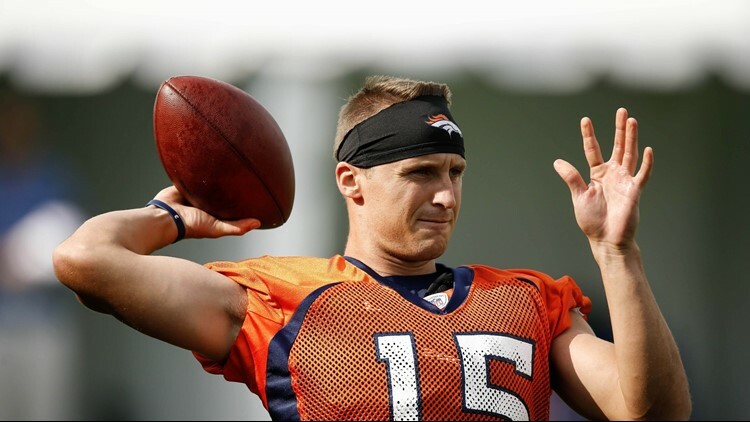 1 quarterback, threw two touchdown passes Wednesday to River Cracraft, a Brandon Stokley-type who spent part of his rookie 2017 season on the Broncos' practice squad. Keenum also completed two passes to undrafted rookie John Diarse, including a deep ball for a touchdown. ENGLEWOOD — There are so many receivers with great hands in the Broncos’ training camp this year, some of them are going to wind up getting cut. In terms of roster transactions, that is. “That’s a good problem to have,’’ said Broncos head coach Vance Joseph. “We want every spot on our football team to be that competitive. Obviously, there's also the practice squad. We've got some good young players that are competing at a high level." Case Keenum, the Broncos’ No. 1 quarterback, threw two touchdown passes Wednesday to River Cracraft, a Brandon Stokley-type who spent part of his rookie 2017 season on the Broncos’ practice squad. Keenum also completed two passes to undrafted rookie John Diarse, including a deep ball for a touchdown. Tim Patrick and Jordan Leslie have also caught passes from Keenum. And this is on top of veterans Demaryius Thomas and Emmanuel Sanders, drafted rookies Courtland Sutton and DaeSean Hamilton, second-year speedster Isaiah McKenzie, and fourth-year man Jordan Taylor, who is on the physically unable to perform list with double hip issues. Another veteran, Corey “Philly” Brown, is just getting started after missing a full week with a concussion. “I think we’re all ascending and that’s the biggest thing.’’ Cracraft said. “Everybody’s getting better every day, including those top guys, Emmanuel and Demaryius. The Broncos’ receiver group is so deep with guys who can catch, they might have nine or 10 with better hands than Bennie Fowler III. That’s not to say they’re all better overall receivers than Fowler, a big body who was a three-year, special teams core player for the Broncos. And Fowler, who is now with the Chicago Bears, will always have third-and-12 from Peyton Manning for 31 yards in a second-round playoff game against Pittsburgh in the Broncos’ Super Bowl 50 season. But straight up hands? Diarse, who got an $8,000 signing bonus after playing two seasons at LSU and two more at Texas Christian, might have the best hands on the team. Cracraft caught a post pattern dart from Keenum that split safety Darian Stewart and cornerback Bradley Roby for a touchdown Thursday. Cracraft also made a one-handed catch on a pass thrown downfield by Paxton Lynch. The Broncos won’t keep more than six receivers on their 53-man roster. But they will cut a few more who will have the ability to make an NFL roster in the future. Von Miller didn't play in the first two preseason games last year. Apparently there are no free passes when you come off 5-11. Joseph said Miller would get some early work Saturday in the preseason opener against the Minnesota Vikings. *Marquette King put on another fine punting exhibition Thursday. *Joseph said after two series, Paxton Lynch and the rest of the second-teamers would come in and play into the third quarter. *The Broncos will have a moment of silence prior to the game Saturday in tribute to former director of pro personnel Tom Heckert Jr., who passed away this week. *With backup right guard Menelik Watson out with a pec injury, Billy Turner moved inside to No. 2 right guard, and Andreas Knappe of Denmark moved up to No. 2 right tackle. *Tight end Jeff Heuerman (knee), safety Su'a Cravens (knee) and inside linebacker Joseph Jones (foot) missed practice Thursday. *Cornerback Tramaine Brock returned from a hamstring injury Wednesday, but missed practice again Thursday.